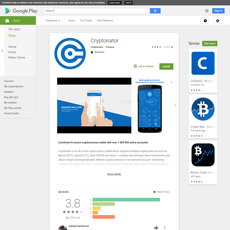 Bitcoin Ticker Widget can be found on Google Play and is available on all Android devices. This widget-based application is very simple and straight forward but offers a lot of value to its users. Basically, the app allows users to set a beautifully designed widget that shows real time data on a specific cryptocurrency and price data from a respective cryptocurrency exchange. You’ll be able to seamlessly monitor your favorite cryptos from anywhere on your home screen. The widget can be resized to fit the entire screen or simply take one 1 block of space. The development team seems to be very active and on top of adding new currencies within just days of their release. They also seem to interact with their users and reply to all comments. The app is lightweight and very easy to use. I have personally had this app installed on my Samsung Note 5 for almost a year now with absolutely no issues to date. It takes up very little space, both on my screen and in my devices memory and doesn’t seem to draw too much energy from the battery. I think it’s a nice visual upgrade on the home screen for crypto enthusiasts as well. This app is great for adding a visually appealing widget to your Android device. The crypto tracking widgets display accurate and up to date information. There are no charting tools.